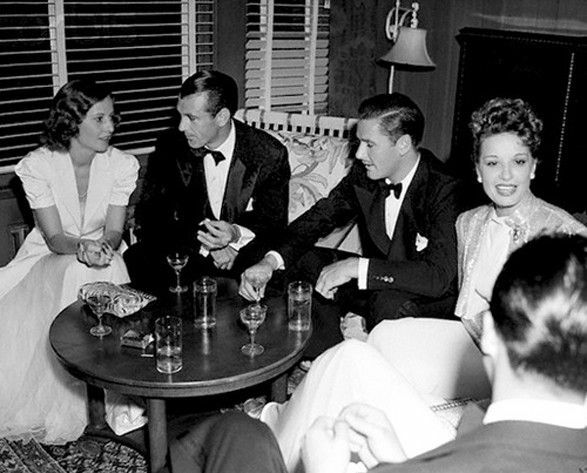 Who wouldn't love to be at this cocktail party? Too many parties are unremarkable, and not for lack of work on the host's part. Some just don't stick in your memory, or leave you feeling thrilled you attended. Maybe they didn’t cast that luminous glow on life, even if for a few moments. If you've ever wondered how to give a cocktail party that makes each guest leave happy, satisfied, and thankful for you, the Dean has a couple secrets up her sleeve. Growing up in Africa, I went to remarkable parties every week, even every night. There were cocktail parties in Mogadishu, Somalia, where we lived in a pink house on a hill over looking the city and the Indian Ocean. All kinds of people attended: ambassadors, hunters, Arabs, Italians. One time American Olympian Jesse Owens came over, the era’s Usain Bolt. Especially overseas, in third world countries, parties build a community for a few hours, lasting til dawn. Those parties ended when the sun rose. I was on my way to bed when most guests arrived, and just waking up when they left. So much concerted effort when it comes to hosting a party -- stress over what to wear, what to serve and drink, how to decorate the house, the gimmicks, the glasses, on and on. The strange miracle that seems to elude us as we busy ourselves with party details is that all these elements don’t add up to a hill of beans. The most important point is to make guests relaxed the moment they walk in the door, able to step outside themselves for the duration. To experience that seizure of happiness, a floating feeling that lasts for days, is the ultimate goal. It all comes down to real meaning versus gimmicks. Gimmicks are fine, fun, even fabulous if they set the stage. Your job is to create magical moments. This takes deep thinking and off-the-cuff intuition. Set the stage that works for your taste, energy, house and budget. It’s not difficult because this is about your personality. Not about money, not about working yourself into a frazzle, not about doing things other people do. It’s about your personality asserting itself in the details. Taste is subjective! If you like plastic and silver together, great. The best houses are personal, not interior design-driven. If you only have time for picking up cocktail snacks at Trader Joe’s and Costco, that's fine too. Tip: buy truffle potato chips and fill with tuna tartare or pickled shrimp. Everyone and anyone, not just the usual suspects. Invite at least a few new faces. Guests fall into two camps: comfortable if they already know everyone else, or ready to make new connections. But everyone everywhere loves to talk with an interesting person, known or not. Small talk gets stale in moments. Don’t let your party become a distant memory because small talk drowned the energy. Cocktail parties, and in fact the most fun parties, are all about the C’s. Be comfortable, which makes others comfortable. Connect guests. Start conversations, using your contacts and your charisma. Serve canapés and Champagne (e.g. Henri's Reserve) perhaps even in punch! For an in-person tutorial on how to host an unforgettable cocktail party, contact the Concierge at the Restoration Hotel to book a private class with the Dean.